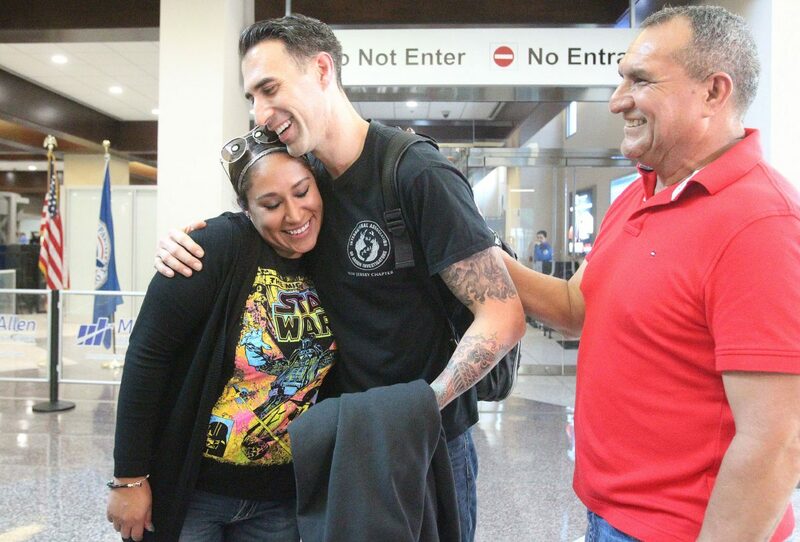 Michael Anthony Scherer meets his sister, Lori Laboy,29, for the first time along with his father, Gerardo Sauceda at the McAllen-Miller International Airport onFriday, April 13, 2018. McALLEN – Sitting impatiently in the lobby of McAllen-Miller International Airport, Gerardo “Jerry” Sauceda couldn’t wait for the arrival of his son, Michael. It all began during a relationship Sauceda was in while living in Chicago. Sauceda eventually returned home to Mission before the birth of the baby, but still kept in contact with his partner. When she later told him the infant died, he had a gut feeling that she wasn’t being truthful. “I kept asking her over and over because I thought she was lying, but finally I realized it was probably true,” Sauceda said. Last year Sauceda’s niece, Pamela Pepper, who lives near Dallas, began researching her family tree, as she is half-Mexican and half-black. One day, she decided to create a profile on an online genealogy website. Michael Anthony Scherer hugs his father, Gerardo Sauceda for the first time at the McAllen-Miller International Airport on Friday, April 13, 2018. While inputting the family names on the online profile, Pepper began connecting the dots and noticed that a Gerardo Sauceda was a name that Pepper and a young man named Michael Scherer had in common in both of the profiles. About 2,000 miles away in northeast New Jersey, Scherer, who knew he had been adopted as an infant, was on the verge of giving up after looking for his biological parents for 14 years, since his early 20s, feeling he had reached a block on the road. Pepper never heard a response, so she told her mother Diana and Diana began asking her siblings about the information, which eventually led to Gerardo, her brother. Scherer, now 34 and married, had begun looking for his parents with the assistance of his wife. During his search, he reached out to hospitals and the adoptive agencies, but the facilities were already closed down, so he decided to contact and send letters to every Gerardo Sauceda in and around Chicago, Illinois, but received no response. Pepper and Scherer continued conversing online and within weeks of their first conversation, decided to take a DNA test in early March. They received the results at the beginning of April that Sauceda and Scherer are father and son. On Friday, Scherer flew to McAllen to finally meet his biological father and the rest of the family who were waiting at the airport. Once both men met, Sauceda embraced Scherer tight and were speechless after seeing each other. Scherer, who is a firefighter captain, was anxious to meet his newest family members and in the future plans to bring his wife and children to meet the extended family, as well. But for now it will be lots of catching up through family barbecues and just getting to know each other.